Phuket, the name itself is synonymous with beautiful beaches, relaxing by the pool, hot sun and natural wonder. The reality however is somewhat different. My trusty trip advisor was not so trusty here. Phuket has become a tourist mecca, innumerable hotels call out for your attention with their superficial signs and false promises of the ultimate luxury. Our “guesthouse” rated 100% on Trip advisor was less than satisfactory. Scummy soap stains, dirty towels, half filled shampoo bottles and meagre air conditioning awaited us. A booking.com super special, thankfully we hadn’t paid the full rate, beacuse it certainly wasn’t the beautiful bargain we were expecting. Luckily, we decided to take a holiday from our holiday and rented a room for two nights in a resort down the road. Upgraded for FREE, we were put in a deluxe room with pool access and best of all, brilliant brisk air con. Thankfully today tripadvisor proved trustworthy again. We had booked a day tour with the fabulous Mr Chai, a bouncy, passionate one man show which was a great way to spend the day. We started the tour by winding our way up to View Point, situated above Kata Beach. The tall green trees began to thin out as we approached the pagoda. Stepping out into the hot air, we were treated to a stunning view over Kata and Karon Beach. On the side of the footpath was a small truck, the tray at the back contained two sea eagles. These beautiful majestic birds sat, waiting for tourists to pay (100baht) for the privilege of taking their photo with them overlooking the beach. Craig gave it a go, whilst Mr Chai and I snapped photos. Whilst an amazing experience, I couldn’t get over the feeling that these magnificent birds should be flying free. We continued on our way down the hill, where we ended up in an elephant trekking park. We were ushered up the stairs into an open air deck where you could select how long you wanted to ride the elephant for and if you wanted to watch a monkey or snake show. A feeling of unease washed over me, as I watched the baby elephant trying desperately to be freed of it’s chain to be fed by a big group of tourists. Against my instincts, we chose a half an hour ride, but instantly regretted it when we saw the unhappiness of the elephant. Our mahout, had to cajole the large, gentle creature into trekking up the hill. Whilst smoking a cigarette, he informed us that he and the elephant had been there for 15 years. I couldn’t fathom it, this creature has been treated as a show animal for 15 years! No wonder he was so unhappy. I watched horrified as he prodded and slapped the elephant, sometimes to an indignant trumpet of the poor creature. We were trapped on a tiny seat, secured only with a rope, sliding precariously as the elephant climbed up and down hills. We gladly hopped off at the end, and agreed to never do that again. The elephant’s unhappiness was juxtaposed by the lovely cat that came to cuddle us as we sipped water on the deck. As she settled purring happily into my lap, I wished that the elephants could enjoy this sort of freedom. An orchid farm on the outskirts of Phuket town awaited, so we set off again. These stunning flowers are an expensive commodity in New Zealand, but here the climate and conditions make growing them easy. We wandered through the farm, admiring the stunning array of colours. It was a little oasis of beauty, a butterfly even came and landed on my hand. Then it was on again. 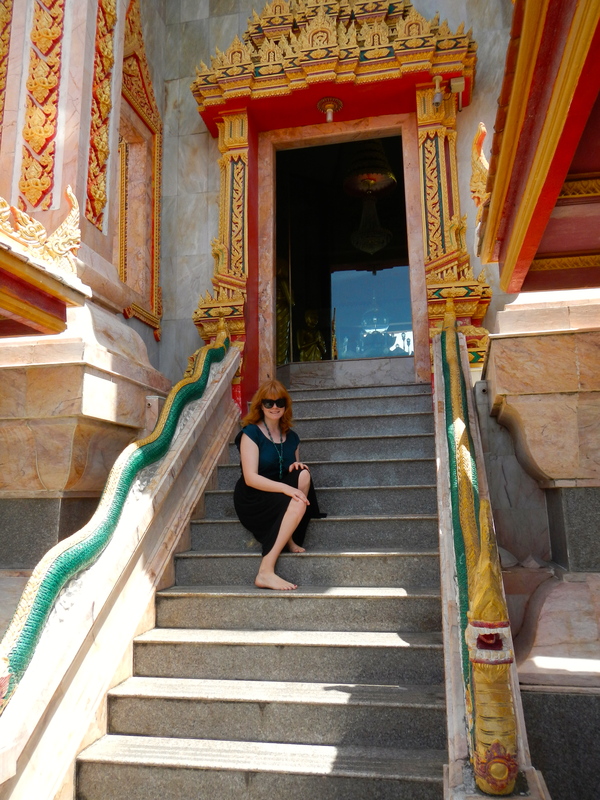 The Big Buddha on top of the hill was next, we traipsed our way up the stairs, sweating attractively as we did so. The buddha was started in 2007 and it is now 3/4 complete, it is funded entirely by public donations alone. The statue and surroundings overlook both Phuket town and Chalong Pier, as well as Kata Beach and Karon and the view is quite something. On the road again, we had time for a quick coffee stop at Mr Chai’s favourite shop. The iced coffee slid down my throat and refreshed, it was onto the Wat Chalong Temple. The word “Wat” in Thai means Temple, the second part of the name identifies the location. This temple was located close to a lake in Chalong and is a complex building adorned with glinting gold, ruby red accents and stark white walls. Climbing to the top in 37° was a challenge but worth it for the view. Look who we found enjoying the sun! Last on the list of destinations was the Kathu Waterfall. The waterfall is located close to the highest point in Phuket, 540m above sea level and off the road that connects Patong Beach and Phuket. The rainy season is the best time to visit this waterfall and we were not disapointed. Water cascades over rocks and gently pools at the bottom. A huge spider web and spider caught Craig’s attention and freaked me out. We climbed the stairs to the top, before quickly snapping a few sweaty faced photos and heading back to the car. It had been a very full and enjoyable day, we wove our way back through Patong back to Kata Beach. Sadly, we farewelled Mr Chai, now our friend and it was time for a swim and rest. The sea eagle is super!!! I agree, he was magnificent! Amazing to see a big bird like that up close :).